BASKETBALL SPOTLIGHT NEWS: Clash For The Cup Highlights: Gonzalez Going Hard! 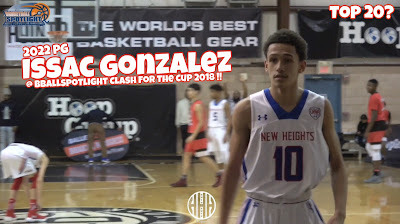 Clash For The Cup Highlights: Gonzalez Going Hard! Issac Gonzalez has been on a tear since the Basketball Spotlight Future Phenom Camp last summer. During the Clash For The Cup he showcased some serious talent. Check out his highlights and remember to stay tuned because we have tons of coverage still coming!